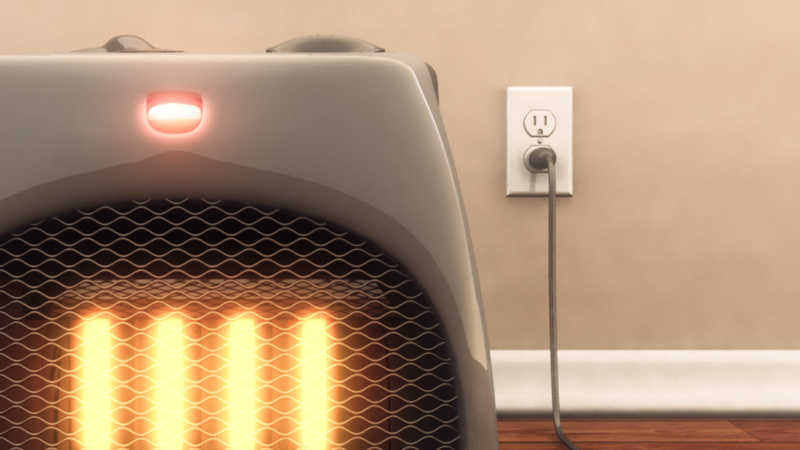 Many people use space heaters for winter warmth, but they can be dangerous if used improperly. The Consumer Product Safety Commission (CPSC) estimates that 25,000 home fires every year are associated with space heaters, and cause over 300 deaths. An additional 6,000 people annually go to the hospital for related burns. These fires are caused by contact with or nearness to the heating elements, flammable fuels used in the heaters, defective wiring, and carbon monoxide poisoning caused by improper venting or incomplete fuel combustion. Keep it at least 3 feet from flammables, such as curtains, clothing, furniture or bedspreads. Select a model with an automatic shut-off, in case it tips. Buy one that is certified by an independent testing lab, such as Underwriters Laboratories (UL). Buy the right size to handle the area to be heated. Keep kids and pets at a safe distance. Never leave it unattended, or sleep with it on. Never use or store flammable liquids near it. Do not use in a bathroom—a high-moisture area can cause damage. Keep it away from water to prevent electrocution. Check the cord for fraying and cracks, and do not use an extension cord to run it. Do not try to repair a broken heater yourself—go to a qualified appliance service center. Visit http://www.cpsc.gov/CPSCPUB/PUBS/463.html for more safety tips on space heaters that use wood or kerosene.